I got a Wii U shortly after launch, and I’m really enjoying it so far. Unfortunately, some of Nintendo’s practices with eShop games and external storage have me wondering what kind of problems, especially with losing saved progress, Wii U owners are going to run into in the near future. 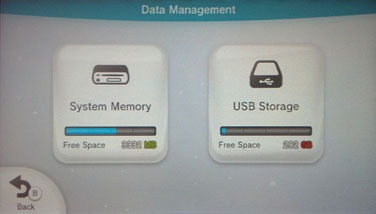 The Wii U supports external USB storage. A few weeks, ago, I got the Wii U Basic Set as it was all that was in stock when I went to pick one up, and I knew I had a spare hard drive laying around I could use to make up for the limited internal storage. That it didn’t come with a Nintendo Land disc was fine, as I’d made the life-changing decision to try going all-digital with the Wii U. So far I’ve downloaded and played the heck out of both Nintendo Land and New Super Mario Bros. U on my Wii U and its really-pretty-great GamePad. Downloading may not have been as quick as I’d like, but that’s something Nintendo can fix, and even if they don’t, it’s only a one-time thing per game (besides the occasional update). Both games are stored on an external hard drive. 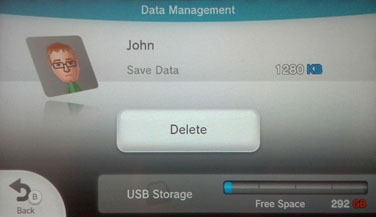 The contents of my Wii U’s external drive. The external USB storage worked without a hitch. I plugged in the drive, formatted it as instructed, downloaded my games, and just played. No hassle. This is quite a lot of progress for Nintendo, coming from the very-limited Wii, whose late SD card support was hindered by the need to copy games to pitifully-small internal memory before playing them. The Wii U exhibits no such limitation. So don’t get me wrong; I commend Nintendo for this much progress, and for taking the steps into digital distribution of retail games. It’s a wonderful step into the future. But it’s a step with the potential to get tripped up. So, here’s the thing. When I got the console, I didn’t have a dedicated enclosure yet for the hard drive I wanted to use, so I swapped in one I was using for other things temporarily. Once my new enclosure arrived from Amazon, I swapped the drive into the new enclousre, and plugged it into the Wii U assuming (okay, hoping) that all would be well. All external drives must be specially formatted. It wasn’t. 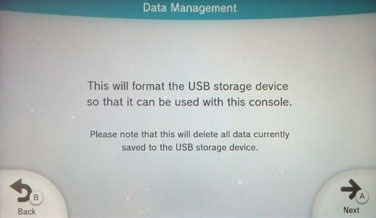 The console refused to recognize the drive and needed to perform its special Wii U-formatting all over again. This tells me that the formatting the Wii U does identifies the disk contents as not only specific to that console, but also specific to that external USB device. This meant I would need to redownload the two games, which I was fine with. So I went ahead and did it. The console-specific thing I totally understand; it keeps piracy difficult. But the drive-specific thing? This means if I have a drive that (1) is failing or (2) for some reason has stopped working with the Wii U, I can’t move the data from the drive to another. In other words, all my saved progress is lost (again) if anything happens to that drive, including things out of my control like drive failure or a Wii U system software glitch. 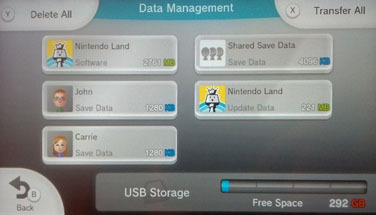 Save data is packaged with the game data. It turns out that downloaded games’ save data is also stored on the external drive, and cannot be moved. 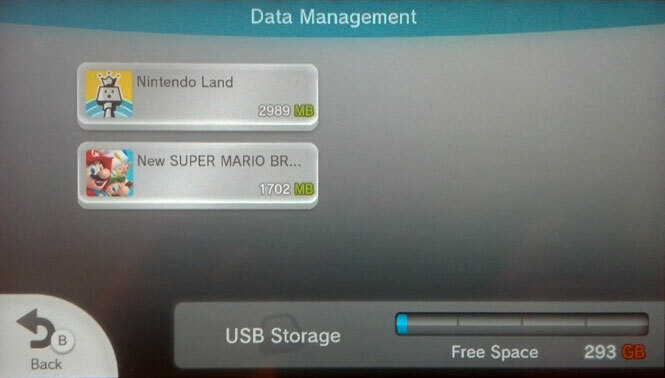 This meant, by reformatting that drive, I lost all my Nintendo Land and Mario U progress so far. Fortunately it wasn’t yet much, and I was happy to re-play the games and levels we’d already played, but this still worries me. Save data cannot be separated from its game. When this hard drive eventually dies, and it will, I will lose my save data no matter what. I can’t back it up. I can’t move it to another drive (although the ability will apparently come in an update, though even then the drive still needs to be working to make the move). I can’t move it to internal storage, since the full games won’t fit on my Basic Set and the save data currently cannot be separated from it. To fix this, Nintendo needs to make a change or two. Here are my suggestions to Nintendo on how to improve things. SOLUTION: Let me copy or move my save data from the external drive to internal memory (separating it from the much larger game data). You don’t store save data on game discs (never mind that it’s not possible); with the options available today, why force me to keep it on the much-more-likely-to-fail external storage? Subsolution: While you’re at it, make identical disc-based and eShop games share the same save data, or at least provide the option. You wouldn’t have separate saves for two separate identical discs; why do it in this case? It’d only make sense if I could use the data on a friend’s console, which I cannot. If I rent a game on disc and then decide I want to buy the eShop version for keeps, I shouldn’t have to lose all my progress. UPDATE: According to multiple Redditors, apparently if you play a disc game then buy the eShop version, the save data will carry over. I’m interested to try this out to see how it works (does the save data become tied to the game data? ); will report back when I do. SOLUTION: Make external storage data only console-specific, not external-drive-specific. This would have prevented my issue above from cropping up in the first place, and makes perfect sense. Why shouldn’t I be able to move around the data (or better yet, back it up) as I please as long as it remains console-specific? Maybe this makes piracy somehow more difficult in theory, but I think it crosses the line of hindering your non-pirating consumer, me, much more. UPDATE: SOLUTION: Sync save data to the cloud. I was reminded in the comments of this, probably the best and certainly the most modern and easiest solution for consumers. Link my save data to my shiny new Nintendo Network account, and sync it to and from Nintendo’s servers whenever it changes. Steam, Xbox 360, and PlayStation 3 all have this capability; why should’t Wii U? Supposedly this functionality is coming, so we’ll see if it pans out. Even just one of these could solve the problem, though implementing them all would be ideal. The ball’s in your court, Nintendo. I’ll continue to buy games on your system, but it’s up to you to determine what my experience with said games will be like. Any possible solutions I missed? Any reasons the above solutions wouldn’t work? Pull out that GamePad stylus and chime in. All screenshots in this post were taken by me from my Wii U’s GamePad screen. Many apologies for the lacking quality of my smartphone’s camera.